There has been an update on 23andMe in the last 24 hours. Layout has ever so slightly changed on ancestry composition. My 1.8 French & German has been allocated now to same area of southern France my mother gets on 23andMe and I now get an added hit on the ancestry maps for “likely” on Ireland where as before I only had area’s of England. 23andMe has now Changed there description/explanation for recent Ancestor maps location. So technically Sharing DNA with people with ancestry going back to one location does not necessarily mean you have ancestry from that location,and maps will change as database grows. Last edited by Claudio; 01-15-2019 at 10:39 PM. Last edited by Claudio; 01-15-2019 at 10:57 PM. Last edited by vettor; 01-15-2019 at 11:25 PM. is the french/german just a northern italian regional similarity thing? Last edited by vettor; 01-15-2019 at 11:36 PM. 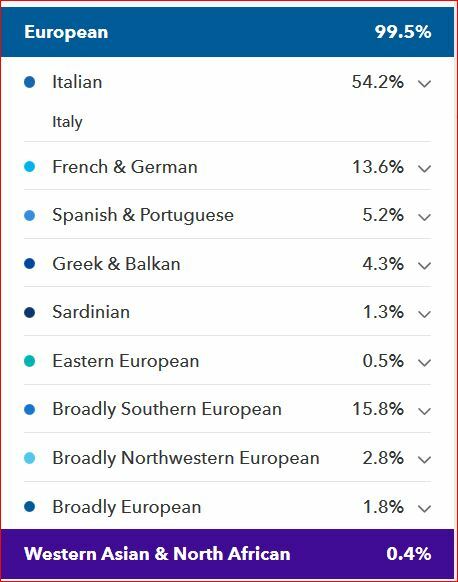 My wife is quarter Italian with ancestor's from the hills above Genoa. Her area are Liguria and Piedmont with almost nothing else chosen. This beta test thing was a good tip because it actually seems to be more accurate from what I know from my family tree and other tests. Pretty cool!